Baby battle? Sounds like a Real World/Road Rules challenge. "I won't let this woman get away." How CAN she "get away" when TC has her chained up every night in the basement Thetan laboratory? The only time she's allowed to leave is to go to one of his kids' school events, to Australia on vacation to prove that Tom is not gay, or to the gynecologist wearing a huge fake pregnancy pillow. These two are made for each other, If this is all she wants from a relationship, climb on. We really won't miss you!!! What I want to know is who is Heather's shocking new man and is Jennifer Aniston pregnant? I couldn't care any less about Katie and Tom. I'm sick of seeing them and hearing about them every stinking day. HOW REVOLTING....they were seen ''making out like teenagers'' at a restaurant in LA. Such class, or COMPLETE AND UTTER LACK OF IT. What kind of an idiot is David Spade that he would even touch this woman with a barge pole? Disaster waiting to happen. I feel horrible for her parents. There is nothing scarier than watching your child fall in love with a psycho. 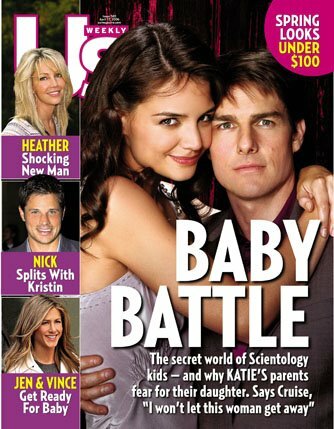 Their out of their minds.....I'm all for religious freedom but Scientology can be cult-like. My best friend's grandmother was a Scientologist and would not give her children's cold medicine when she was sick, she only gave her herbal tea. Her cold ended up turning into several infections because it went untreated. LOONIES. When you fake a pregnancy as a publicity stunt, you sign up for all of the criticism in the world.